Elliot is a senior at Torrey Pines High School and started playing the cello at the age of seven. He is currently the principal cellist at the San Diego New Youth Orchestra and the principal cellist at Torrey Pines High School Orchestra. He began his musical career in San Jose under Janelle Paek, then studied with Jonathon Koh, a music professor at UC Berkley. Currently, he is studying with László Mező, a music professor at Chapman University. In 2012, he was the principal cellist at the El Camino Youth Symphony in San Jose and in 2013, the principal cellist at Palo Alto Chamber Orchestra. 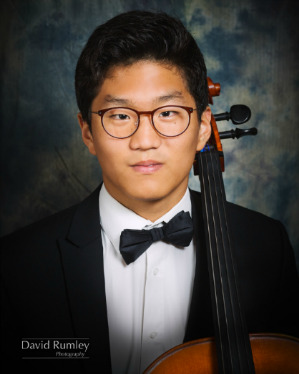 After moving to San Diego, he became the principal cellist in advance chamber orchestra of Carmel Valley Middle School (2014-2015) and was a finalist for the director’s award performance. He has received third prizes in the 2015 Classics Young Artist Alive Competition and the 2015 MTAC Goodlin competition. His trio won 3rd place at the 2014 VOCE competition and 2nd place at the 2013 Southern California Mozart Festival. He also received 2nd place at the 2014 SYMF competition and 3rd place at the 2015 MTAC Concerto Competition. At the 2016 Satori Strings competition he won the grand prize with a cello duet. He has won 1st place at the 2016-2017 San Diego New Youth Orchestra solo competition and received a scholarship, 1st place at the 2017 Southwestern Youth Music Festival at California State University Long Beach, 1st place at the 2017 American Fine Arts Festival International Romantic Competition, and 1st place at the 2018 Crescendo International Competition with a performance at Carnegie Hall. He has also been given the honor of performing for László Mező Sr. in a masterclass. László Mező, the original cellist in the Bartók String Quartet, is a renowned cellist who has worked with Zoltán Kodály on the composition of the Kodály Cello Sonata, and has also worked with Pablo Casals. Outside of music, Elliot has been swimming competitively for 11 years and is on the varsity swim team at Torrey Pines High School. He is also the Regional Director of the Back to Bach San Diego branch and leads fellow musicians in events held for introducing and teaching various instruments to young children. He also teaches cello to students with autism and prepares them for the biannual AMASE concert. He has been a part of AMASE (Academy of Music and Arts for Special Education) for 5 years and loves giving private lessons to special needs students.